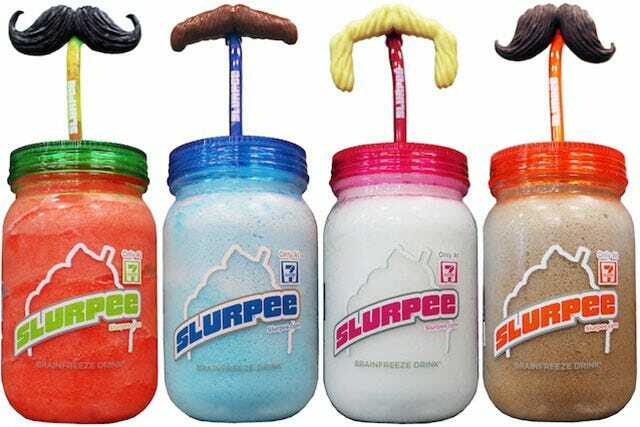 Here's how you know hipsterdom is officially the most mainstream thing in the world: 7-Eleven has just co-opted the whole mustache thing for some novelty Slurpee cups. A press release from the chain actually used the phrase "It was only a matter of time." You can't make this stuff up (if you can, please call us immediately). The cup is a "retro-like" mason jar approximation, sold for $2.99 and completely reusable. The straw has a mustache on it, costs 99 cents, and is completely ridiculous. If you thought brunch pictures and #belfies on your Instagram were getting old, be prepared for this to become the overwhelming trend for at least three months. On the bright side, though, 7-Eleven did say they're inspired by the illustrious Ron Swanson — which makes us want to go out and buy some immediately. According to LAist, the cups and straws will be available for your ironic drinking pleasures at nationwide 7-Eleven locations this summer. Now, all you need is some Phrosties delivery, and you'll be set for the most heavily photographed summer of your life!